It amazes me how much progress has been made on the house in just 10 weeks! Marvin and his crew are working very hard and last week was no exception. 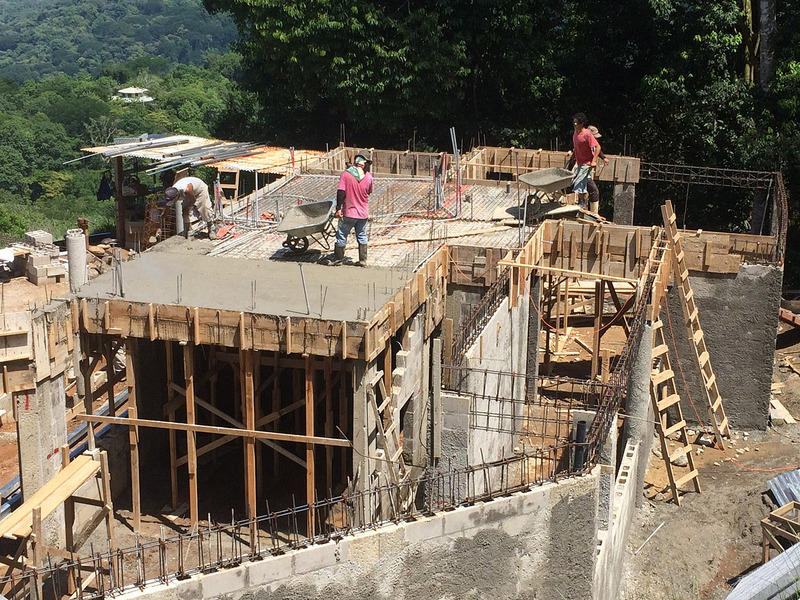 The concrete floor on the other (kitchen) side of the house was completed. 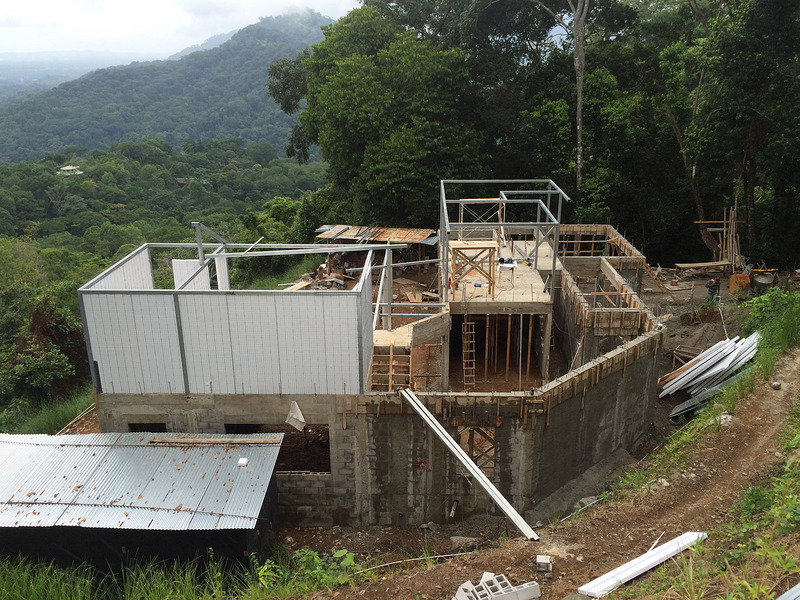 Back on the other side of the house, some of the Panacor panels were put into place within the steel frames of the walls. The panels are placed over and attached to the re-bar anchors sticking up out of the concrete floor. 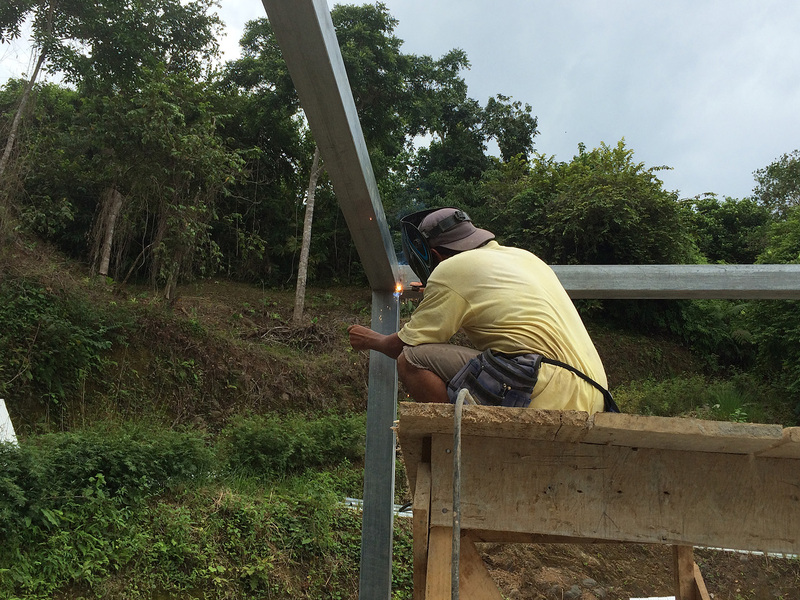 Then the panels are stitched to each other with wire and also fastened to the top structural member. 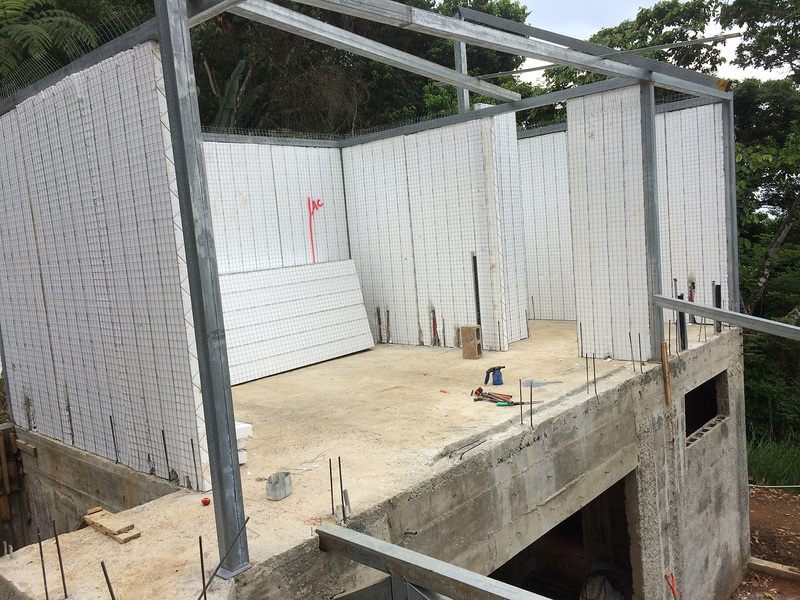 The Panacor foam panels are starting to go in the walls of the second floor guest suite. 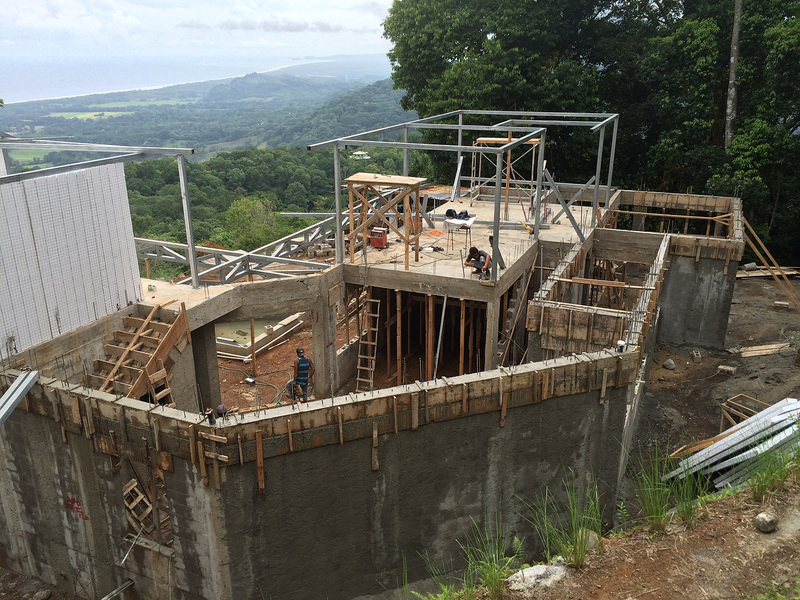 Here you can also see a portion of the stairway being formed. 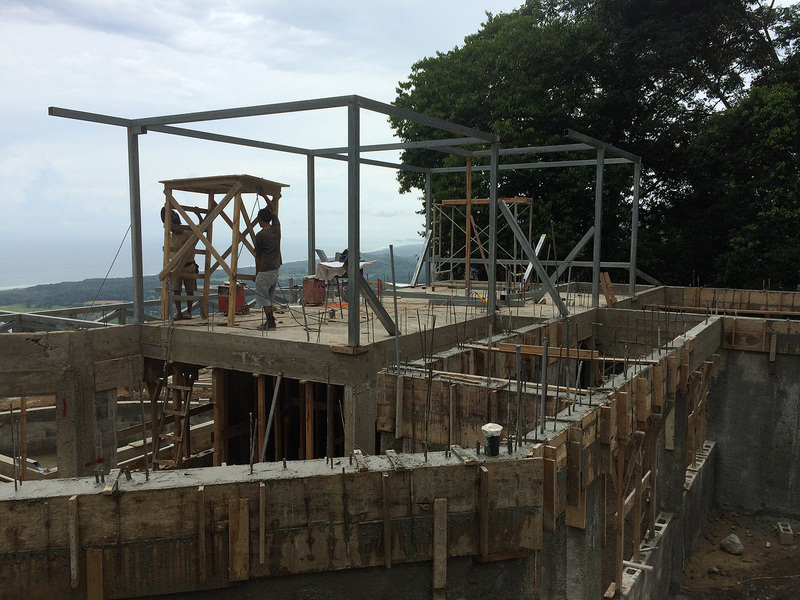 Once the concrete floor on the kitchen side of the house had set up sufficiently, work began to frame the walls. 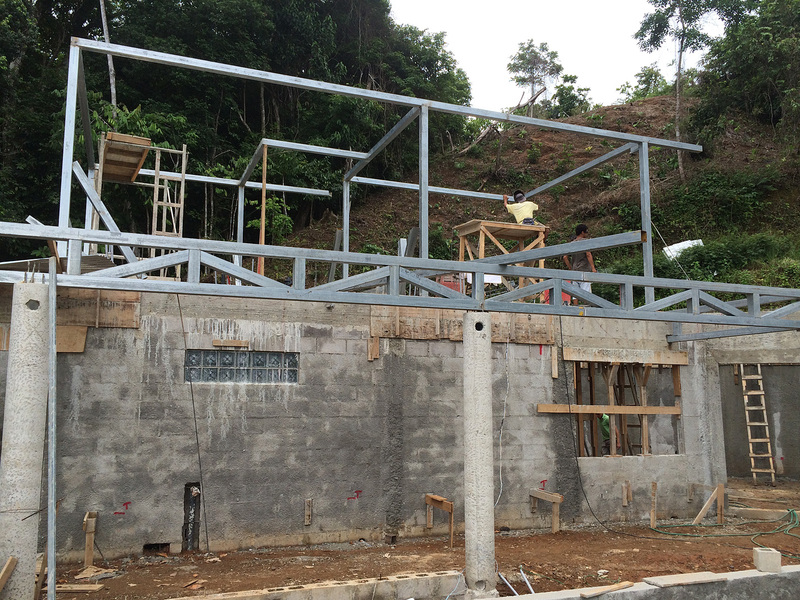 The steel framing is being welded together. 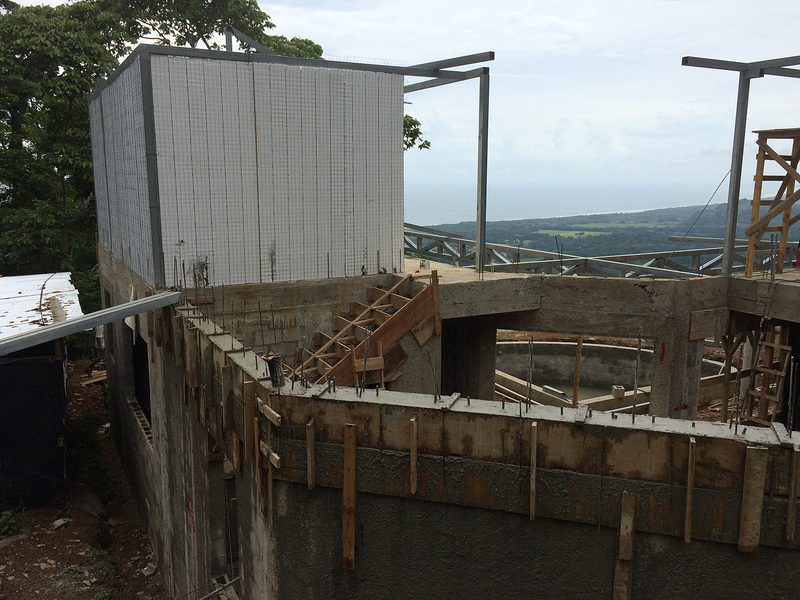 In the photos above, you can also see that the remaining crown beam that runs along the top of the block walls has been formed and poured. 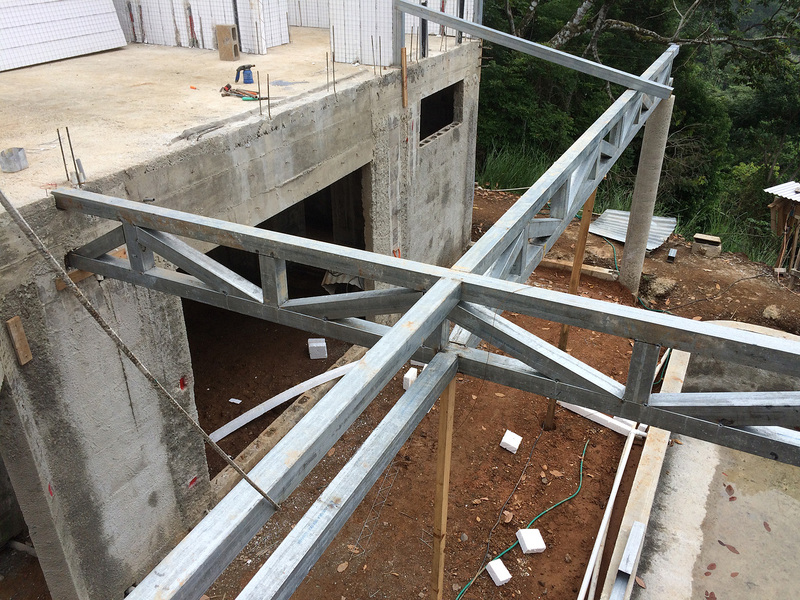 The other addition this week was the fabrication and installation of most of the steel beams that will support the roof over the terrace around the swimming pool. You can see them in the photographs above and a closer view is shown below. This is looking down on the entryway to the front door. 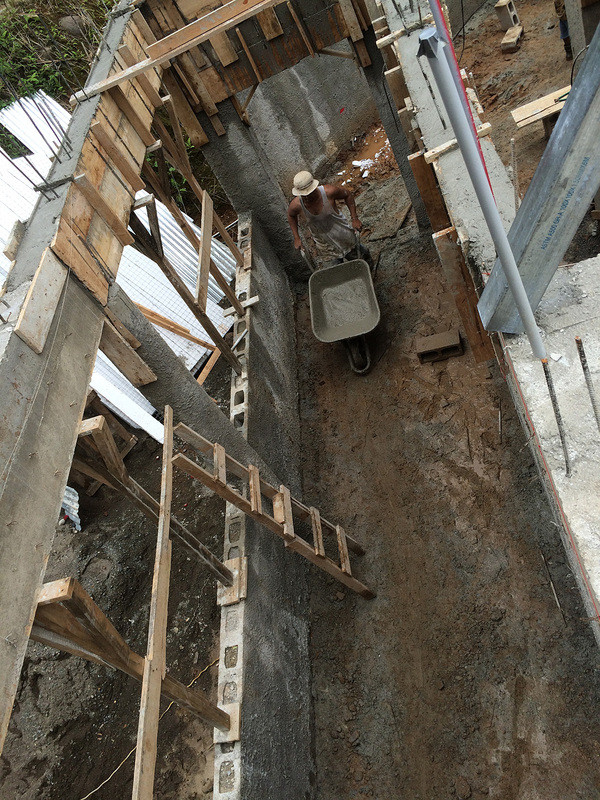 This is where the other stairway will go (to the guest bedroom and study above the kitchen and bodega). 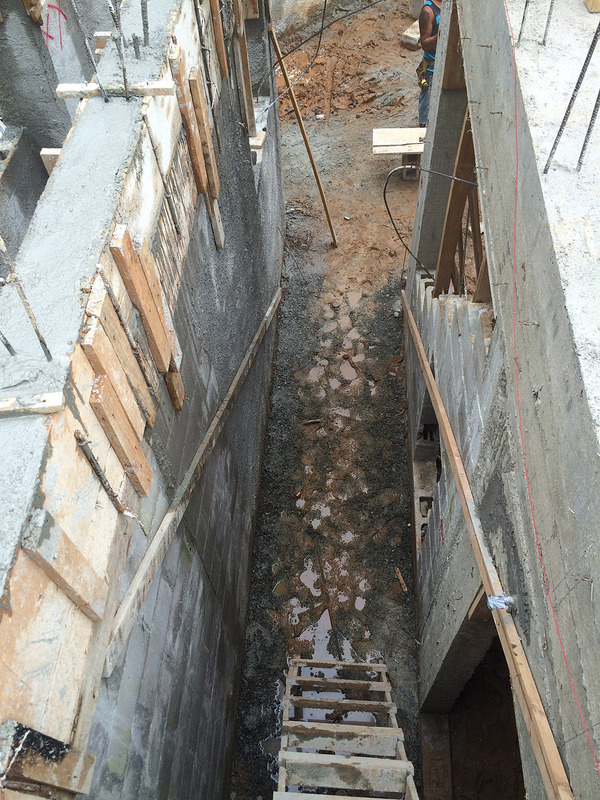 Underneath this stairway will be a small pantry off the kitchen. 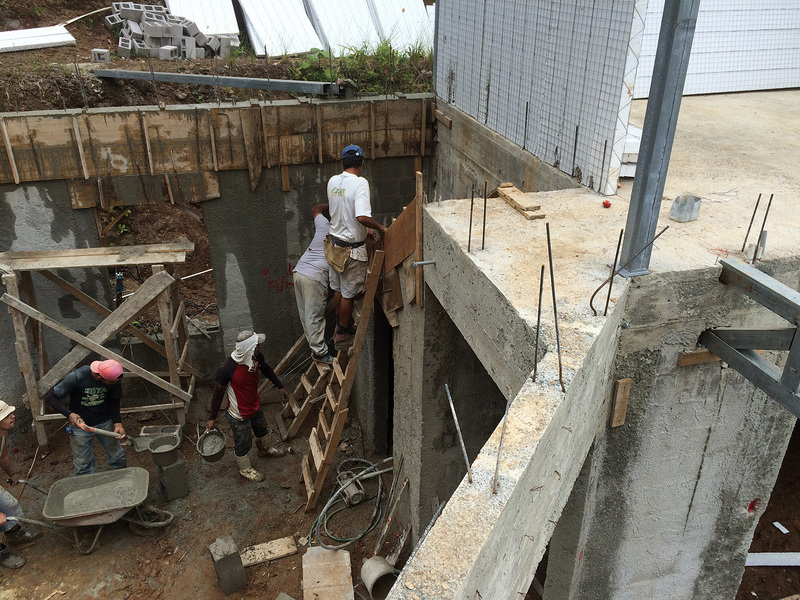 Here the guys are working on the stairway to the guest suite. Hasta la proxima semana….Until next week! Hi Ellen! Progress looks fantastic. So excited for you! Where is eddie’s quarters! Wait is that steel for a cage?